Peter Foster, President of Air Astana, was the forthright and entertaining speaker at the Aviation Club in London last week. Prior to the speech Air Astana hosted a press visit to Almaty, headquarters of the airline, on-line from Heathrow and the commercial centre of the country. “There’s a surprise every day in Kazakhstan,” commented the Air Astana PR Manager as we departed from a hunting lodge restaurant in the quiet resort of Tau Dastarkhan, half an hour south of Almaty, Kazakhstan’s former capital. We’d just been serenaded by a beige-suited, white-shoed, Kazakh who had an Elvis smooth voice, and was singing the best of the The King’s ballads. A genial white-gloved waiter served French wine and greeted us in broken English with “Welcome guests, we are most happy to see you in Kazakhstan,” a republic that is just under 20 years old. Previously the whole region was closed to the rest of the world by its Soviet masters. It is the 9th largest country in the world with abundant oil reserves, coal and a plethora of minerals. Flying to Almaty from the UK is about the same as New York, with half the flight over Kazak territory. 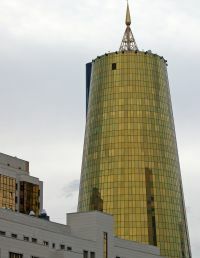 Ruled since inception by the current president, Nursultan Nazarbayev, the country has developed from once being the USSR’s nuclear testing ground, space programme launch pad, and over-worked agricultural plains, into a modern day economy that is flourishing, even in the current financial crisis. Nazarbayev has led the country into stability and his open engagement with the west has supported the development of business relationships that under Soviet rule would have been unthinkable. One of the greatest success stories of the new state is Air Astana, the national carrier which has a fleet of 22 western aircraft including four Boeing 757s, two 767s, seven Airbus A320s, two A321s and one A319. There are also six Fokker 50s serving shorter internal routes. The airline is owned by the unlikely bed fellows of Britain’s BAE Systems (49%) and the Republic of Kazakhstan’s holding company Saruk-Kazyna (51%). Nazarbayev personally requested support from BAE systems in 2001, to help create a national carrier that would be recognised and valued by the rest of the world. 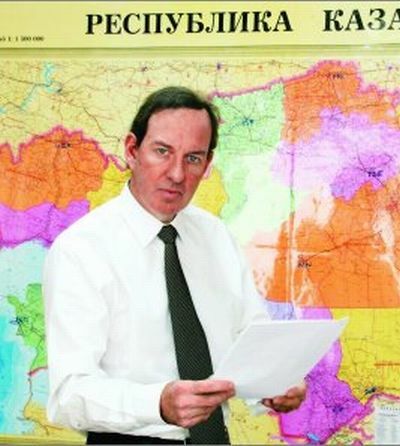 The airline’s current mission statement “to provide profitable domestic and international air services to the highest standards of air safety and customer service in order to serve and compliment the needs of the Republic of Kazakhstan,” drives the business which is led by charismatic President Peter Foster. In today’s challenging financial environment with western national carriers struggling to maintain revenues, it is surprising to learn that Air Astana, a business launched just eight years ago is profitable, reporting net profits of US$48m in 2009, and is expected to exceed this in 2010 with the half year accounts showing US$33.5m before tax, up 34% from the same period last year. Revenue growth comes from an increasingly mobile Kazakhstan public who maximise the internal network which serves 15 cities. In a country so large travelling between cities is more or less impossible by any other means. Internationally Air Astana is also spreading its wings. Its position at the heart of Central Asia allows Air Astana’s fleet to serve regular routes to both eastern and western destinations. Kuala Lumpar has proved one of its most recent success stories joining other regular flights to Bangkok, Beijing and Moscow. To the west Frankfurt has daily flights and Heathrow serves its UK passengers twice weekly, a schedule the airline is seeking to improve. Whilst the average age of the fleet currently sits at eight years, this is set to lower with the addition of two new Embraer 190LRs in the first quarter of 2011. These are destined to serve the near abroad as Richard Ledger the airline’s Director of Sales calls destinations such as Tashkent and Dushanbe. Whilst the fleet is less modern than more familiar global airlines, this does not detract from the comfort and in-cabin service. As one who never sleeps on overnight flights, I was pleasantly surprised to find myself stretching out of a deep sleep about 20 minutes before landing in Almaty. I put it down to a mix of the good food, excellent amenities keeping dehydration at bay, and the delightful summer duvet to snuggle under making the eight-hour journey more comfortable than many I have endured. Most of Air Astana’s traffic is currently driven by business travellers who are working with local and international companies. This market is reflected by the ads included in the in-flight publication Tengri. The usual perfume, fashion and gadget ads are replaced by ads for mining equipment, corporate solution services and banking. The business theme continues in available accommodation designed for business comfort, The Holiday Inn, Hyatt and Rixos hotels in Almaty all offer excellent services for the business visitor, whilst in Astana the Radisson, and other internationally recognised hotel chains offer 5-star quality for the visitor. However there are a surprising number of reasons for the more adventurous tourist to visit. The imposing Tien Shan mountains towering to the south of Almaty are the perfect playground all year round offering fabulous skiing in the winter, and heart pounding treks in the spring and autumn. East of the city the Charyn Canyon is compared to Colorado’s Grand and offers white water rafting and kayaking. The Tau Dastarkhan resort offers a mix of spa services, horse riding, cycling, and a must for anybody seeking an insight into traditional Kazakh hunting techniques, an Eagle Hunting sanctuary. 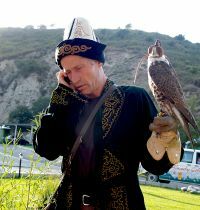 The blend of old Kazakhstan merging with the new was perfectly epitomised by our ornithologist, dressed in traditional Kazakh hunting clothes with resplendent bird of prey on arm taking a phone call on his state of the art mobile. For a real sight of what the future holds for this stunning country a visit to the new capital designated in 1994, Astana, is essential. Viewed from the air on a sunny clear day, Astana appears as a city bejewelled with a myriad of colour. 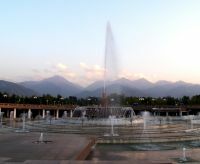 Where Almaty is leafy, verdant and relaxed in ambience, Astana, as the bureaucratic capital, offers wide boulevards lined not with trees but with striking modern edifices. This broad expanse of a city still lacks an obvious cohesiveness but already has its own set of style, surprisingly supplied by a blend of Japanese architectural town planner Kisho Kurawara and Britain’s very own Sir Norman Foster. The Pyramid of Peace and Accord is a behemoth building housing a concert hall, meeting rooms, hanging gardens and is the venue for a tri-annual global religious conference. With a diagonal moving lift, visitors are overwhelmed by the open space, and windows adorned with images of doves of peace. Compare and contrast this to the newly opened Khan Shatyr, also a Foster creation, shaped as Kazakh nomad’s hat. Externally representing all that is old and traditional, internally visitors experience a shopping mall any globalised country would be proud of, but more surprisingly a set of fair-ground attractions including a mono-rail, and bizarrely a full beach with sand shipped in from Saudi Arabia, waterfalls and and a water chute. Close to the pleasure dome is the spectacular Foster designed football stadium. 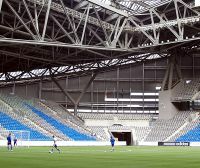 This will be the venue for the opening ceremony of the Asian Winter Games in late January 2011. Construction for the event, co-hosted in Astana and Almaty, is well underway. Following the games tourists will be able to take advantage of the superb selection of winter sports facilities. The Winter Olympics are on the target list.